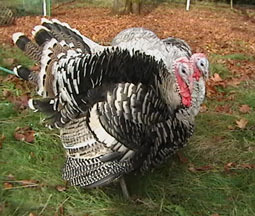 A Narragansett and a Grey Slate turkey twinning up. Turkeys are very social and love to come a-calling. Before dawn we rise. The young turkeys first. and a tide of bubbling water sounds greet the morning. to the eager joy of food and cool water. as hungry chicks crowd round and in the tray. A bold chick chases a grasshopper through tall grass. each being finding that next first thing. errrr-maup-maup-maup, then, hearing our steps, silence. then brief hush of flight. for a 3 second tryst. picks up damp grass, filling the valley with diamonds. toward a bucket of apples swinging in our hands. long blue tongue around green apples. reflection living in each breath. perch on fenceposts, hungry like us for morning. we count the turkeys roosting high on the bar. a soothing weaving of calm, the closing of the day. (Oh, look at how big you grew today. Your feathers are so bright. Oh, you have new white feathers under your wings! And look at you, all cozied in for the night.